From the way things are looking, with its large amount of industry support and unanimous praise, Mudbound could very well be a game-changer this awards season. Ever since it debuted at Sundance back in January, it was already lavished with positive feedback for its ensemble cast, its director and co-writer Dee Rees, and its impressive craftsmanship from the production design to the cinematography, but when Netflix picked up the distribution rights, and later premiered it exclusively through its streaming services (in addition to a limited theatrical release), it soon attracted even more headlines for it possibly becoming the very first major awards contender to debut via a streaming platform. It’s an important movie for several reasons; not just because it could very well represent a turning point in movie distribution when it comes to end-of-year awards consideration, but because it is also a powerfully made, incredibly acted and spookily timely story of pride and prejudice, albeit in a far different context to what Jane Austen probably intended. Based on the novel by Hillary Jordan, it is the story of two families living on a farm in rural Mississippi in the 1940s; the white McAllens, which consist of Henry (Jason Clarke), his wife Laura (Carey Mulligan), their young daughters, and his racist father Pappy (Jonathan Banks); and the black Jacksons, which are held together by Hap (Rob Morgan), a tenant farmer who works on the land his slave ancestors once worked on, and his wife Florence (Mary J. Blige). Both families deal with several issues like severe poverty, prejudice around every corner and – most crucially – having family members returning home from the Second World War. It is these two men, Henry’s brother Jamie (Garrett Hedlund) and Hap and Florence’s eldest son Ronsel (Jason Mitchell), that form a strong connection with each other due to their traumatic war experiences, which given that this is 40s Mississippi is unlikely to end well, which is putting it mildly. This was a time and place where a person of colour could not walk down the street without angry white eyes looking in their direction, but in this case it is even more degrading when we know that Ronsel is a certified veteran of war, and yet despite serving his country he receives almost no respect from anyone in it. He finds that people were far more accepting in Europe, even ironically in Germany, so to come home and be harassed by seething white men for merely using the front entrance of a store is heartbreaking proof that no matter what they did to help save the free world, young coloured men and women would still be judged for the colour of their skin. That’s one of the many things that Rees in her direction and writing (she co-wrote the script with Virgil Williams) manages to highlight in such a powerful way, so when he does eventually make a friend in Jamie you end up sighing with relief that there is at least one person in this community who understands how he’s feeling, and thus doesn’t treat him like a second-class citizen as everyone else seems to do. Rees, with this film, proves herself to be a serious filmmaking talent to watch, as she handles raw emotional scenes with tight emphasis on the situation and how it can already make one’s blood boil from characters’ aggressive racism, and she directs her actors to deliver some truly captivating performances. Among them, Mitchell and Hedlund have the best chemistry and give some of their very best work both together and individually with just the simplest of inflictions and amounts of dialogue; meanwhile, the likes of Mulligan and Blige give wonderfully understated performances that show their frustrations and inner turmoils without wearing it too much on their sleeves. It’s very much an ensemble film, one where every cast member is nothing short of fantastic, not least because they’ve been given some fine direction and stellar material to work off of, as well as the fact that they are working with a cinematographer, production designer etc that really help to elevate this from being just any tale of racism in the south. It can be a rough watch, purely from there being so much hatred directed mainly at people who really do not deserve it, but it’s worth sticking through for a bittersweet conclusion that gently hints at a brighter future, even if at this time there isn’t much brightness to offer. It’s all part of a film that is a game-changer in many other ways aside from its awards possibilities. 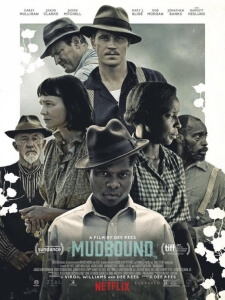 Mudbound is a powerfully told and exceptionally acted drama of poverty and racism that can be heart-breaking to watch, but always has a steady heart to carry it through its darker moments.